Megaflex timing belts are manufactured in thermoplastic polyurethane, with continuous spiral steel cords. this type of belt, developed by our research & development, offers good running characteristics and high traction loads. They are especially suited for power transmission and conveying with high loads and high speeds (up to 10.000 rpm). 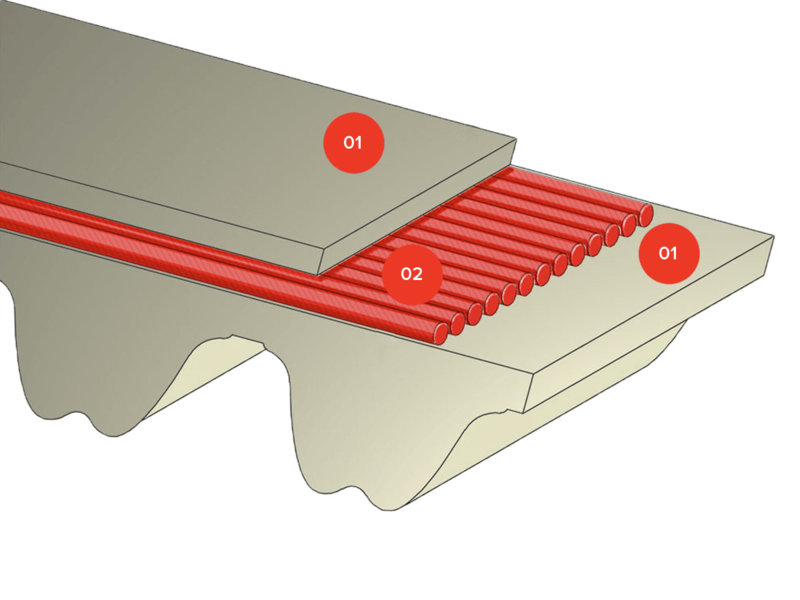 The addition of a nylon coating on the teeth during production enhances the running properties for specific applications and reduces the noise frictional coefficient. An extra thickness of special coating is also possible on the back of the belt offering extra protection against aggressive or heavy products. Megaflex belts are truly endless, enabling them to deliver exceptional performance. MEGAFLEX is manufactured to the customer’s length specification. This belt is especially suitable for power transmission and conveyor applications with high load and high speed. The body of the belt is white thermoplastic polyurethane 92 ShA, characterized by high levels of wear resistance even in the presence of shock and surge loading. High strength helically wound zinc coated steel tension members allow high breaking loads and extremely low elongation. Available with Kevlar, Stainless steel, HF, HP, HPF, HP stainless steel. Are you interested in MEGAFLEX?